Mike Turner, a 2009 Bluecoats member and captain of the Elysian Independent Open Winter Guard, submitted this photo and caption. These two photos are of my good friend, Carlee, and me. 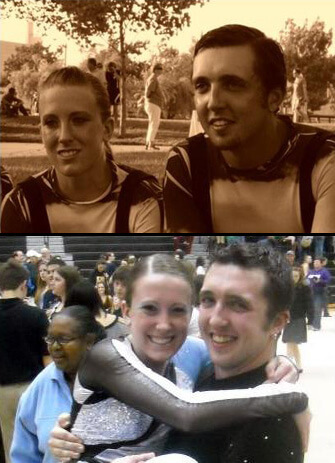 We met as rookies with the Bluecoats in 2009. We developed an incredible friendship over the summer, and as Dave Meikle, our caption head, spoke to us before our Finals performance, we sat beside each other. We cried as we said goodbye at the Bluecoats banquet the morning after the DCI Finals. Little did we know, however, that we'd be seeing each other again at the Winter Guard International Richmond Regional in March. It was wonderful to see my friend again, and it was even sweeter that we got to support each other in our Finals performances!